Léargas: ITS GOOD TO LISTEN. This blog was out late last night. Not late by the standards set by our James and some of his carousing friends. But fairly late by my own mundane get-to-bed early, up early–in-the-morning habits. Anyway on this very wet Belfast Saturday morning let me wish you all well. I am pleased with myself this soft day because last night saw the last of the Town Hall Meetings. And a very good meeting it was also. The Town Hall Meetings are annual events conducted by Sinn Féin throughout the North. We are also doing other public meetings in the South but they are more tied into the elections than the ones in the North. There is a lot of anger in the South at this time. A wee bit of all-politicans-are-tarred-with-the-one-brush but mostly a really aggressive and very widespread annoyance at Fianna Fail. The mood in the Town Hall Meetings is different. Generally speaking most of the discussions have been low key, thoughtful and wide ranging. Issues discussed include the on-going political and peace process, the environment, education reform, policing, agriculture, the Irish language, the recession, Irish unity, Sinn Féin’s record in government, and a multitude of local issues from roads to planning. The recent killings of the PSNI officer and the two British soldiers and the republican response to it also featured at some meetings, though interestingly not at them all. None of the cheerleaders for these killings, or others who threaten Sinn Féin turned up at any of the meetings. Last night we were in Craigavon. There was a little bit of excitement at the beginning of the meeting when a small group of slightly inebriated loyalists tried to enter the Craigavon Civic Centre but their effort was half hearted and they left when a Lurgan republican stalwart appealed to them to go and sober up. It is a mark of the times we are in that all this passed off without undue rancour. And without most of the people at the sizeable meeting being aware of it. Most of the older ones among them were conscious that this was the first Sinn Féin meeting in this particular Civic Centre. Brendan Curran, our man from the Munchies was certainly pleased with the turn out and the venue. The first time Brendan turned up, eons ago, as a newly elected republican councillor he was ejected. Unlike our slightly unsober loyalist brethren Brendan refused to leave and despite being the target and victim of gun and bomb attacks he kept coming back. Last night he brought a few hundred other good citizens with him. Fair play to them all. It is good to talk. But it is also very good to listen. And that’s one of the main reasons for the Town Hall gatherings. This blog and others get to hear what the punters have to say. There are lots of other things happening at this time but they will have to wait for another time and another blog. One of the important issues is the Visteon dispute. Workers in occupation of the factory presented medals to supporters who joined them on the protest. While there are issues to be resolved this blog feels that the workers, their families and the community did a great service for workers rights when they forced Ford and Vesteon to the negotiating table. That is no mean achievement. Well done to everyone involved. And thanks for my medal. Last Monday saw the death of veteran republican Madge McConville. Madge was a wonderful woman. She was born around the time of partition and spent her political life actively working to bring it to an end and to achieve a united Ireland. She was arrested and imprisoned first in the 1942 when an IRA operation in the Clonard area led to the killing of a member of the RUC and the arrest of IRA Volunteers Tom Williams, Joe Cahill and others. Tom Williams was hanged by the British some months later in September. 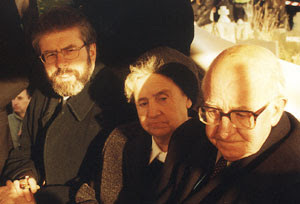 Madge was a wonderful woman who kept faith with her republican beliefs over an immensely long time. She was a mother, a grandmother and a great-grandmother who along with her late husband Tommy, reared her family during the huge upheavals of our time. To Madge’s family circle and to her many friends let me extend my sincerest condolences. Go ndéanfaidh Dia trócaire uirthi. Best of luck to the EU candidates. If "it's good to listen," then why isn't anyone in Sinn Fein or the Department of Education listening to Colaiste Speirin in Cookstown? It has been two full years of tone deafness. That is a long, long time and everyone now feels no one gives a damn about Irish medium.